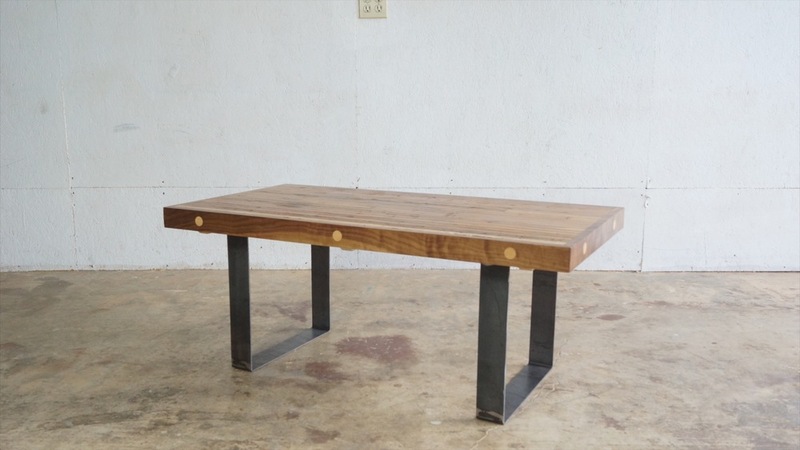 Today on Modern Builds, I'm turning an old piece of bowling lane into a modern industrial coffee table. If you want to find a piece of bowling lane for yourself, check your local craigslist. I looked on mine, and some were available. I got a reclaimed lane from a friend of my dad's. 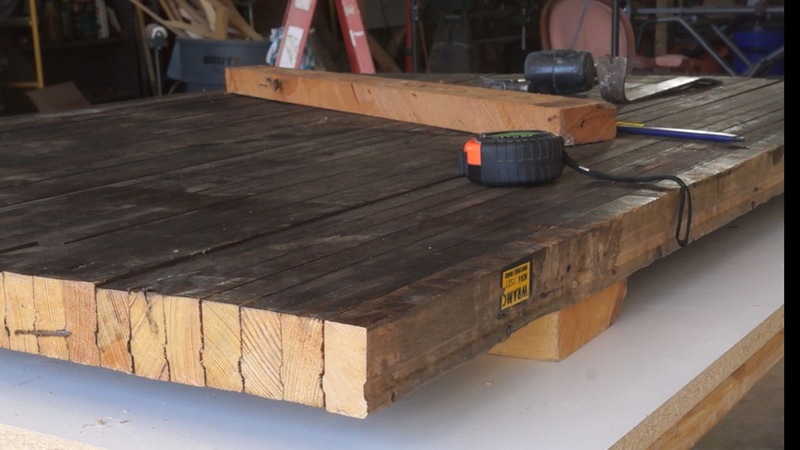 It was used as a workbench top and in really rough shape. I used the circular saw to cut the lane to 22"x44". Be aware, I cut through some nails. Don't use your favorite blade on this! The bowling lane isn't rigid, so I added some wooden stretchers to keep everything square. I used a belt sander to clean up the face of the slab as well as to remove the tongue from the tongue and groove joinery on the edge. I used walnut to trim out the slab. I used a forstner bit on the drill press to cut holes for dowels centered 5" from each edge. I also added one in the middle of each long piece. I clamped and glued the trim pieces onto the slab. Once the glue dried, I drilled out holes on the lane for the dowels. I made a simple stencil out of a piece of paper of a 4" tall 1" wide triangle. Then spray painted arrows on the slab. I sanded the arrows after the glue dried to distress them to match the lane. I used the 16" steel frame style legs from Industrial By Design. They look great, and I couldn't be happier with them. I cleaned them off with some grease and wax remover, then screwed them to the lane. I used a Satin wipe on polyurethane from Minwax.